The trump Policy Decision Making Skills! HE HAS NONE! #trumpWHISPERER! NON-DEAL CLOSER! Doesn't know what he's doing! trump " AS YOU KNOW I REALLY REALLY DON'T LIKE THAT IDEA! " 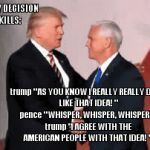 pence " WHISPER, WHISPER, WHISPER! "